Finally. It’s finally October however that doesn’t mean the weather is cooling down any 😦 We had an enjoyable weekend with windows open and the AC off… today it’s sticky-humid and 72 at 8:30am, a high of 90 is expected. Just when I wanted to start decorating for Halloween/Autumn the weather gods turn! I love heat and I love sun but I’d take a real fall before winter gets here – it’s supposed to be a doozie again this year. 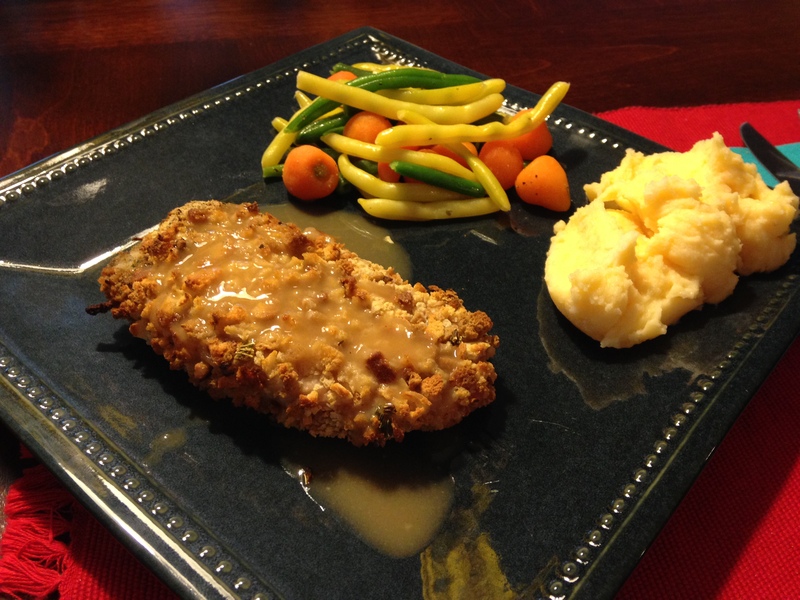 So with the tease of cooler temps I started to introduce new comfort foods to the weekly menu. How about stuffing covered baked pork chops.Yes you read that right. Since stuffing is a no-no item with our new eating ways, I was missing it. I think it’s overlooked 99% of the year and then everyone goes crazy with it at Thanksgiving, it needs to be used more often and this is a great way to incorporate it throughout the year. Egg wash, flour, egg wash, coat in uncooked stuffing – seriously it’s that easy! Bake it and cover with yummy gravy (it’s absolutely needed or else you might chip a tooth on the stuffing, lol). Add some veggies (steam bag, cheat!) and instant mashed potatoes (added lots of shredded cheese, another cheat!). I’ll tell ya once again – if you have a “labor intensive” feature for dinner then opt for easy side items, in my case steam-in-a-bag veggies and instant potatoes. 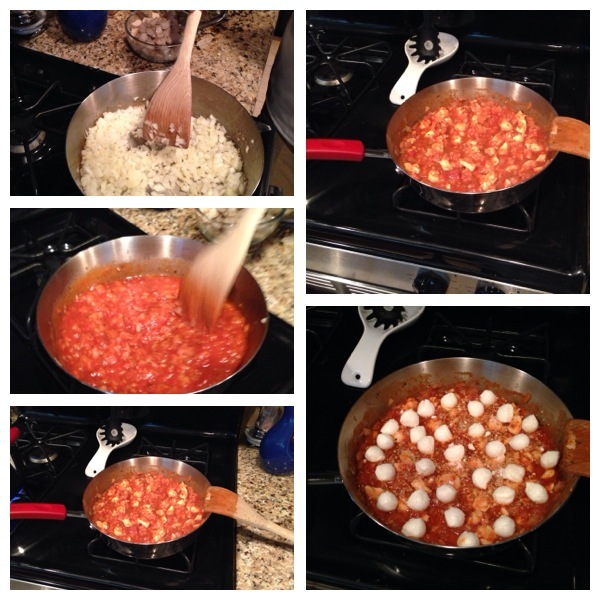 Use your own extras or seasonings to add some creativity and flavor. Although 2 pork chops took maybe 10 minutes to prep but dredging is messy which is why I picked easy side items. 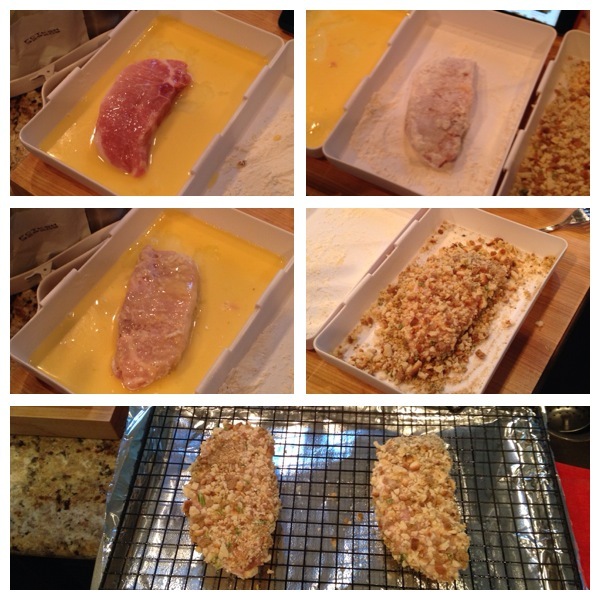 Baked fish was on order as well this past week, I’ve made it once before – it’s a Rachael Ray recipe. 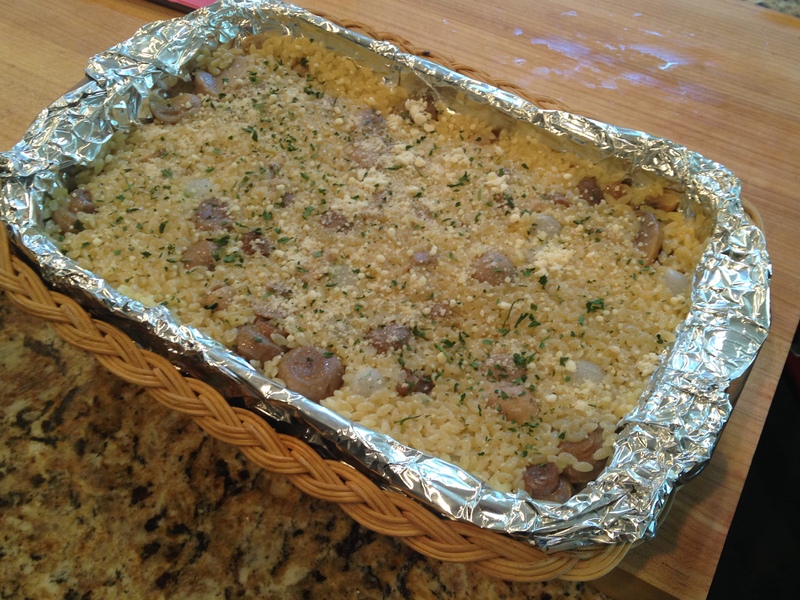 Giving another nod to comfort foods I whipped up a mushroom & orzo dish, this one I’ve made 2 times before (1st time grand reveal at Christmas), the 2nd time I used whole wheat orzo and it was disgusting … the texture was not appreciated by myself or my husband, it was like cardboard! SOGGY CARDBOARD! I went for regular orzo this time and it was just as yummy as I remember the 1st time was. It’s a keeper. I’ve also started using frozen pearl onions, do yourself a favor and copy me. Peeling a pearl onion is a pain in the neck x 12 (how many I originally used). I had to turn it in to a casserole because I cooked it in the morning and reheated it for dinner. Who’s up for a 2 pot meal? EASY CLEAN UP!!! I heart the Pioneer Woman and her yummy creations. This recipe was on her show a few weeks ago when it was still 90 degrees and I was waiting for the right time to make this. Friday it was beginning to cool off and I knew the weekend would be nice as well; we always have leftover pasta so I wanted to enjoy it over the weekend too; anyway it was perfect! We got comfy on the couch with this piled high in a bowl, then there was silence. A sure bet that the meal is delish. Ok so back to the easiest dish ever; the pasta is cooked in 1 pot and the sauce/chicken/moz cheese goes into another. 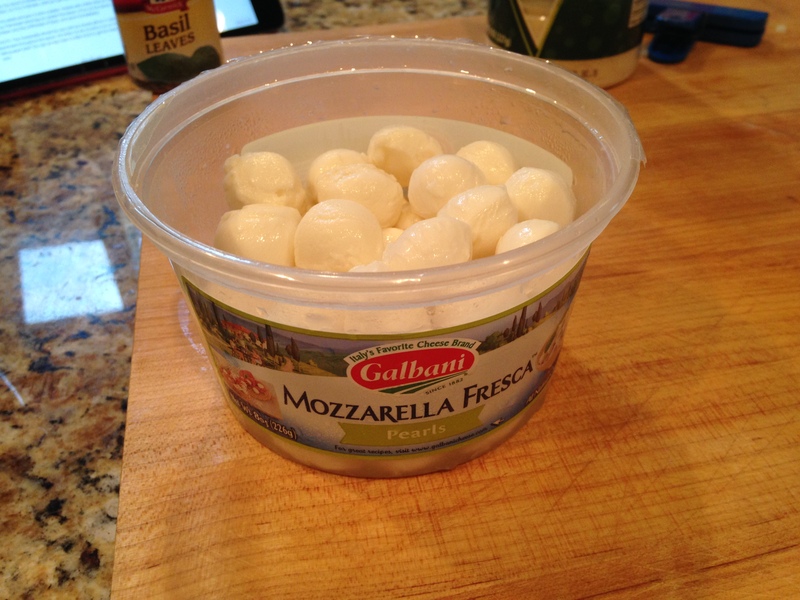 The cutest thing EVER at the grocery store were these mozzarella balls – you could either fight with the huge ball of moz and slice/dice it into small pieces to scatter around the sauce OR buy these lil fellas! Same price and none of the fuss. Yes of course it made plenty of leftovers which we enjoyed on Sunday, we needed a meal to comfort an embarrassing Steelers loss … while it didn’t make us feel any better about that game our stomachs were at least satisfied. At the beginning of last week since it was bea-u-tious and I figured to make a fun, tropical inspired steak. The sun was shining and screamed “MANGOES!”. I found the most amazingly juicy mango and was incredibly pleased with how much “meat” was on that sucker. I’ve finally figured out how to slice mangoes the right way, thanks to The Kitchen (TV show). 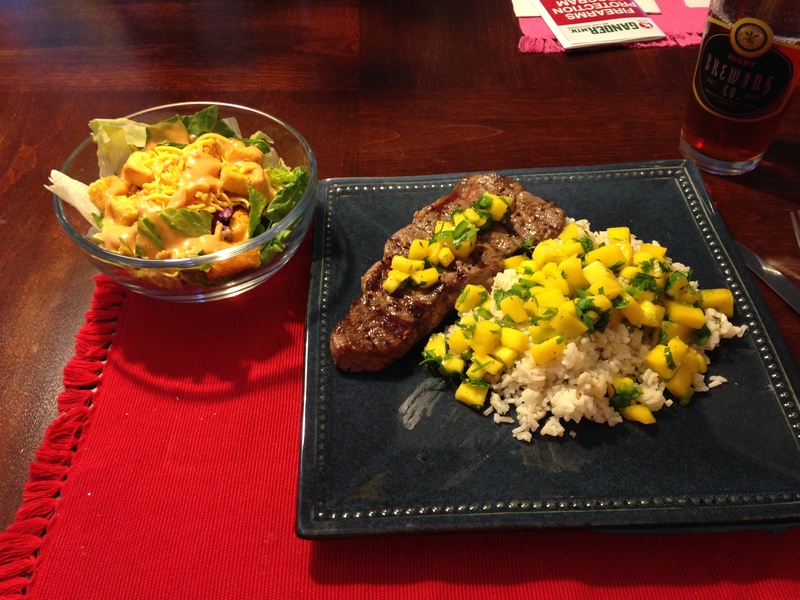 Here it goes – I used the mango mixture on top of the rice and steak, 2 for 1 deal. All it is, is mango/jalapeno/cilantro/lime juice. DONE. While the rice cooked I tossed in cilantro and lime juice to boost the flavors. Once plated I topped the rice with mango and same for the steak, add a side salad and it really looks like something you’d pay a good penny for at a restaurant. Hubby is home for dinner for the next few weeks due to a training class he’s in right now so he actually has “normal” work hours. I love it and am living in the moment each night we get to have dinner together – no planning what can be reheated and not turn in to rubber, it’s pretty fantastic.